Anyone fascinated by what happened to Anglicanism during the course of the 20th Century ought to come to Redgrave. In 1900, the Church of England was on the cusp of its splendour, and the next twenty years would see its star rise to the highest point. And yet, less than a century later, it has suffered a massive loss of nerve, as its significance, influence, and congregations have waned in spectacular fashion. It would be easy, and understandable, for Anglicans to bewail the fate of their Church, which is no longer even the largest in the country in terms of practicing adherents. But if, in some places, it has pretty much lain down and died, there are other parishes where the Church of England has had the wit and wisdom to reinvent itself for the future, and Redgrave is one such place. This pretty parish is a little unusual in that the village which takes its name is not the largest settlement in the parish. That honour goes to Botesdale, which jointly forms a tiny town with the adjacent village of Rickinghall, and has its own chapel of ease of St Botolph. Redgrave's magnificent church of St Mary, the mother church of the parish, sits about a mile outside the village surrounded by gently rolling fields, and with one of the largest and most interesting graveyards in East Anglia. Redgrave St Mary found itself in the news in the first years of the new Millennium for rather bizarre reasons. After years of struggling on as a tiny congregation in one of Suffolk's largest churches, the parish of Redgrave controversially declared its church redundant, against all advice and wishes of outside bodies, in the safe knowledge that it would be taken on by the Churches Conservation Trust. Technically speaking, they were wrong to do this - the CCT exists to take on redundant churches that no one else can care for as a last resort, but it will only take on those which the Church of England asks it to, and these will only be those important ones which have already been declared redundant. It was never intended that congregations would get out of repair bills by declaring the building redundant. There was even a suggestion that, in a fit of pique, the CCT would not be asked to take on Redgrave St Mary, but this of course was not a reasonable outcome. Redgrave parish had fiddled the system somewhat, although it would certainly turn out to be a happy outcome for their church, and the event generated a frisson of interest in the parish. 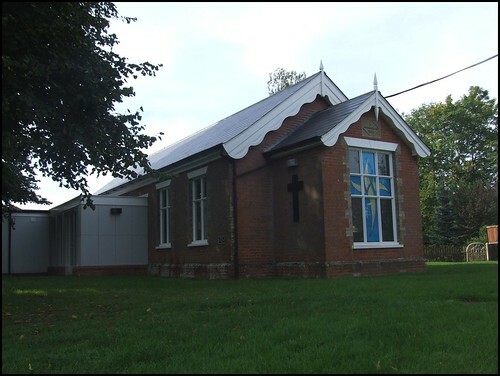 By 2007, Redgrave St Mary had been chosen by the Daily Telegraph as one of its village churches of the year, largely and ironically because of the increased involvement by local people in their now redundant church. For a couple of years, Redgrave's Anglicans went down the road to Botesdale instead, but plans were afoot to convert the village's mission hall, built in 1897, into a more appropriate 'worship space'. This was opened in August 2008. The effect is very much like stepping into a refurbished congregational chapel. The east window has been replaced by a design in perspex, depicting a cross which looks a bit like a dancer and a bit like a flame. From the outside, it looks as if it should light up at night, but is a little seemlier from inside. People I spoke to in the village were very pleased with their 'new' church, and understandably talked it up a bit - one described it to me as 'the first new village church in Suffolk for over a century', which is techincally true if you are just referring to the Anglican variety, but seemed a curious claim to make under the circumstances. In all honesty, it must be a bit of a comedown after the years of glory.